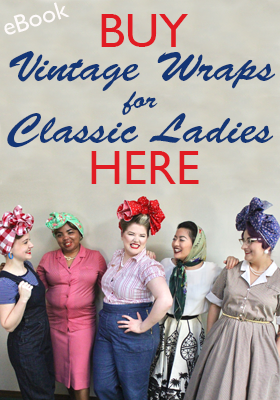 When I found out Time Capsule Fabrics was a sponsor this month, I was excited. 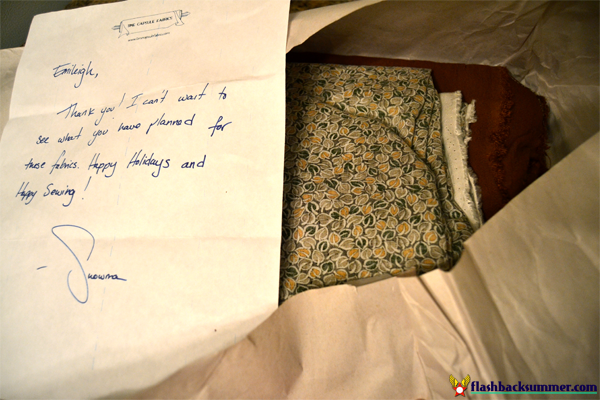 And when I found out I could review some of the fabric for you guys, I was elated! I'll be honest, I had heard of TCF via another blog post, but I was put off the by the prices of the fabrics. While $10-$19 a yard is actually quite reasonable, especially considering the raving review I'm about to give about it, that amount was too much for me to spend as a risk. I had never heard of anyone actually sewing a garment with these fabrics, and I was afraid they wouldn't live up to my expectations of reproducing vintage fabric authentically. 1. Rayons are hard to find in modern stores. 3. If they happen to feel similar, the print is all wrong for vintage looks. Good, vintage-appropriate rayon is hard to find. I also want to note that after I measured all my pattern pieces and determined the yardage it would require, I realized I would need more fabric than had been offered to me to review. I was more than willing to use my own money to buy more of the fabric I needed, although Snowma, the owner, told me that would be unnecessary. I wanted to include this so you guys know I legitimately like this fabric, and not just because it's free. Drape and feel is nice, but how does it compare to vintage rayon? 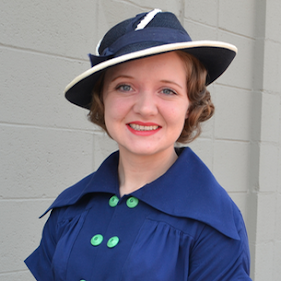 I compared the rayon crepe with a 1940s dress and 1930s dress I have that are both made of rayon crepe, and they are remarkably similar, especially to the 1930s fabric. The drape, texture, and feel is spot on, along with the slight amount of stretch and perfect weight. The fabric really feels vintage. I've never sewn with a rayon challis before this project, so I didn't know what to expect. 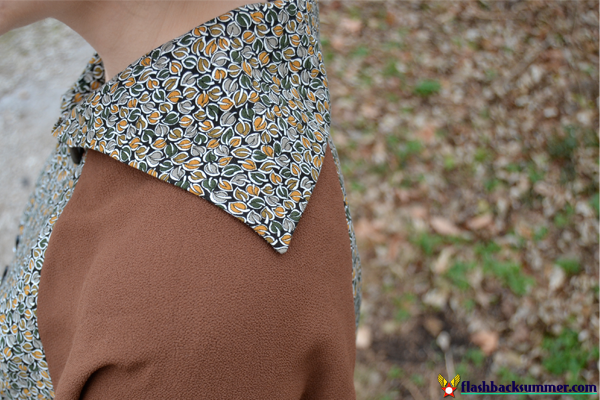 While I can't compare it to a vintage garment with the same fabric, I do know that I LOVE this rayon challis. It has the gorgeous fluid drape of a rayon, but it isn't "slickery" or difficult to sew like some of the smoother rayons. I REALLY like it! It's thin and airy and fantastic! While I will be posting outfit and pattern details in future posts, I wanted to focus on the fabric itself today. 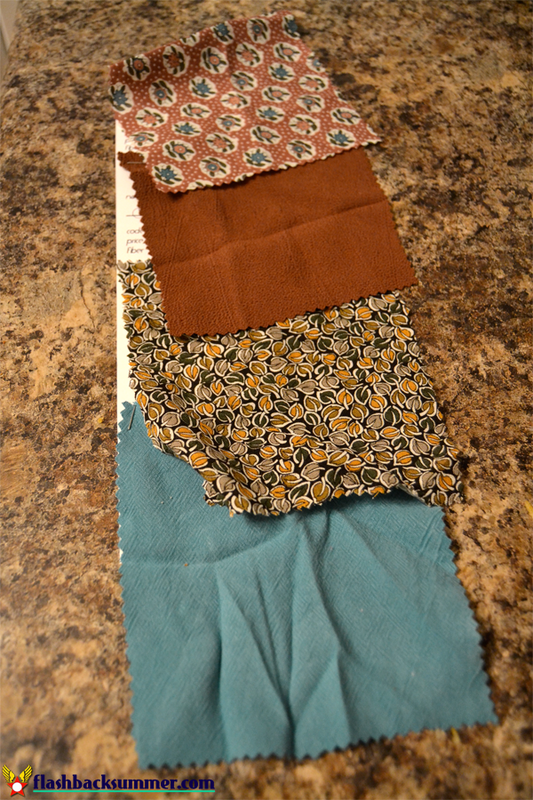 Overall, I am extremely pleased with the Time Capsule Fabrics I have used, and I will be going back to the shop for more. I appreciate the variety of vintage reproduction prints they offer, and the fabrics are far superior in vintage authenticity to the modern varieties available. I highly, highly recommend the company for their great customer service, prompt shipping, and quality products! Let me know if you have any other questions or details you would like to know about the fabric, and I'll be glad to answer them! I received the fabric to make this dress c/o Time Capsule Fabrics in exchange for this review, but all the opinions expressed in this post are my own. To learn more about my collaboration policies, click here. Eeep! Can't wait to see your new 30s dress! Mine is not quite finished. I need snaps and to find a nice belt buckle but that's going to have to wait until after the move. I SCRAMBLED to find a belt buckle and buttons for this in the right size and look. I really wish I could find authentic ones, but I didn't have any in the right color on hand, and it's hard to find SIX old buttons that match! Thank you so much for posting about this Emileigh! 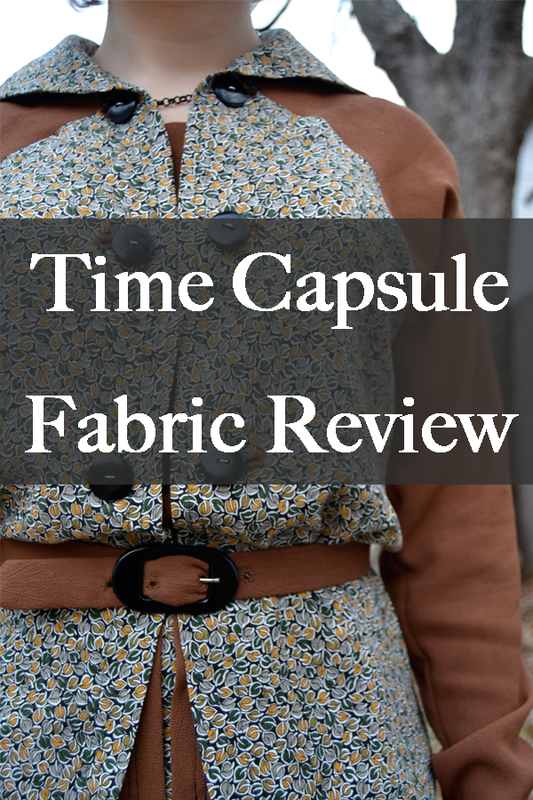 I have been looking at Time Capsule Fabrics for a while now, and your post has given me the confidence to consider purchasing from them next time I am preparing to buy fabric for a new dress. Oh good! I had the same confidence issue, so I'm glad this has been helpful to you! A sneak peak at your lovely creation! I can't wait to see! They've got some beautiful reproduction fabric. Tucked away in my stash is some old quilting fabric and this company has stayed pretty true to the colours and design of the era. That's hard to come by. I'll be keeping them in my list of go to people for sure. That's what I love, too! It is really very authentic, and I hugely appreciate that! It's the look and feel of vintage, without being terrified of ruining a one of a kind piece of history, like with real vintage fabric! Thanks for the review! 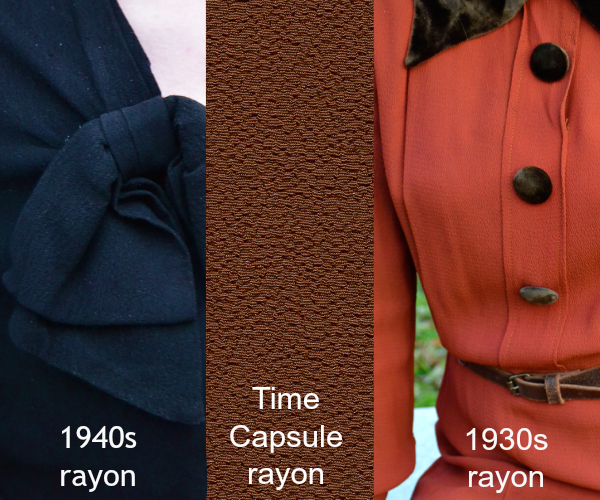 I had not heard of Time Capsule Fabrics before. And you are so right about finding period appropriate rayon fabrics. I think I will be ordering some swatches for myself. Can't wait to read more about your dress! Engaging, wonderful review. Aside from on Brittany's blog, I hadn't heard of this company's offerings before either. 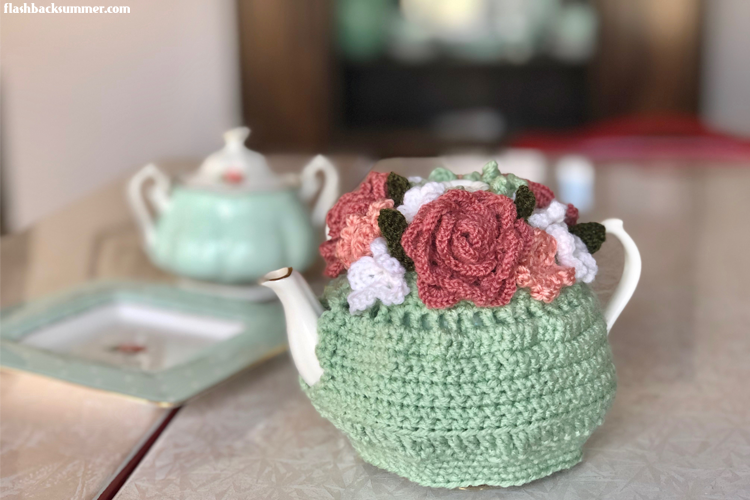 Their great name alone is what made them standout in my my mind, but now that I know more, I feel like - even though I'm not a sewer - I need to come up with a crafty excuse to splurge on some of their beautiful vintage-y looking offerings one day.